Harlem Lovebirds: I'm Looking For . 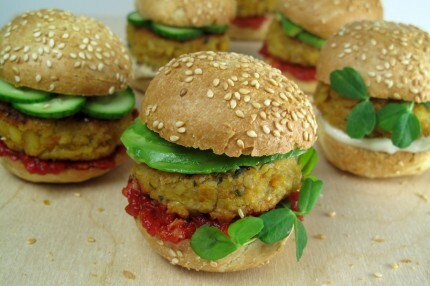 . .
An awesome chickpea sliders recipe! Last summer Mr. Love Bird and I went to an alumnae event for my high school, Columbus School for Girls, at Lincoln Center and they had delicious chickpea sliders as hors d'oeuvres. We had never had them before and ever since we can't stop talking about them especially since watching Forks Over Knives a few weeks ago. We definitely want to start eating less animal products and move beyond just Meatless Mondays. I asked a friend who's vegetarian if it was normal to use mayonnaise in them as that's what I saw in one recipe I pulled up and she said it was but to try olive oil mayonnaise. Great idea! I HATE mayonnaise but if it's mixed into something it should be OK especially with olive oil, which I love. The same recipe also included miso in the burgers which apparently helps old it together. I haven't cooked with miso before so I think this would be a fun way to start! Another recipe I came across uses red potatoes. I think I'd like to try that one too. I think a taste test post is in order . . .
Have any of my readers made chickpea burgers? If so, what works for you?